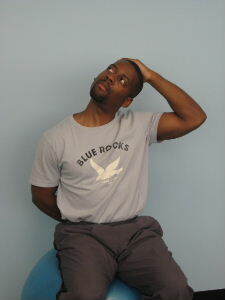 Neck stretches can help to ease muscular tension from prolonged sitting at a desk or ab exercises. Stretching exercises are often neglected, but below are 3 simple stretches for your neck muscles that are good to do while you're sitting at your desk. 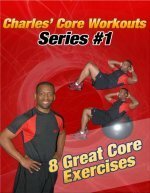 These stretches are also good as a warm up before an ab workout or a cool down after a tough ab workout. To stretch the right side of your neck, place your right hand behind your back (or grab the side of the chair or bench with your right hand if you are sitting.) Putting your hand behind your back anchors your shoulder, so you get a deeper neck stretch. 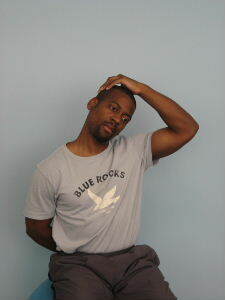 With your left hand, gently add pressure to your head and tilt your head to the left. Move until you feel a stretch and then hold that position for 20-30 seconds. Then, repeat on the other side. When you move directly to the side the emphasis of the stretch is in the upper trapezius and the scalenes. This stretch is done in the similar fashion as the above stretch. 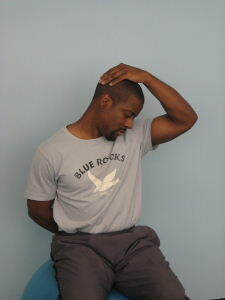 However, instead of tilting straight to the side, you should look down towards your armpit before tilting to the side. By looking down, you shift the emphasis of the stretch to a muscle called the levator scapulae, which is towards the back/ side of the neck. Many people feel this is the tightest area of their neck. The Sternocleidomastoid muscle goes from your sternum and clavicle up to the base of your skull. It gets really tight if you have forward head posture, or sit at a computer for extended periods of time. This stretch is done in a similar fashion to the others. Instead of tilting straight to the side or looking down, during this stretch you begin by looking up towards the ceiling before tilting your head to the side. These are simple neck stretches. Hold each stretch for 20-30 seconds. Repeat them daily. If you are experiencing neck pain, you should consult with a health professional.